I am in a dress mood this season! The weather is so beautiful in the Northeast, it’s hard not to want to wear dresses everyday. I saw this stripe interlock knit fabric on sale and knew I couldn’t pass up such a great deal. 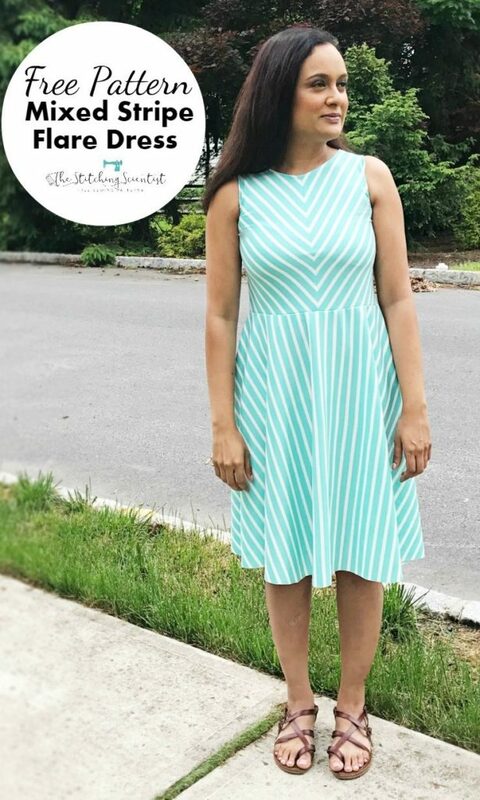 I decided to make this Mixed Stripe Flare Dress Pattern and share with you guys. It really is such a versatile tutorial when working with stripes. The pattern comes in four sizes; xsmall- large. I am absolutely loving how this dress turned out. The top of the dress is a standard tank top pattern but cut on the stripes at an angle. You can move around the pattern based on the angle and look you are going for. The bottom of the dress is a standard half circle pattern. Again, depends on how you fold your fabric, you can get lines that go vertical or horizontal. I like long lines as they make me look slimmer. For my dress, I used the xsmall pattern which is for a 32 bust. I also made my skirt a bit long to hit my knee but you can go up higher if you are looking for a skater type look. I also think this Mixed Stripe Flare Dress will look stunning paired with a denim jacket. By the way, the half circle skirt bottom instead of the standard gathered bottom really makes the waist look slimmer. Don’t you think? With a gathered bottom, I find you always have to wear a belt to hide the gathers. What do you think? Oh, and please excuse my ashy legs in this picture! I obviously need to moisturize (haha). The pattern comes in multiple sizes (xs-l) with xs having a bust of 32″. You can also use any medium weight jersey knit fabric if you don’t want interlock. I find that interlock is soft and heavy enough for dresses. When cutting the fabric, you will get four pieces that you need to assemble to make one top pattern. Use the same top pattern for both the front and back of the dress. The seam allowance of 0.38″ is already built into the pattern. Print at 100% scale.